With a lifetime’s enthusiasm for history and archaeology, Ian is committed to helping people appreciate how important it is to understand the past as a way of understanding the world. He has many years of research and writing experience, and a specialist knowledge of maritime history that ranges from the Middle Ages to modern times. Ian also has experience at all levels of the museum profession, from national to local museums, and from researcher to curator and manager. He has worked successfully as a museum consultant since 2007, playing an important role as an interpretation specialist and researcher for projects in London, Southampton, Portsmouth and the Lake District. He has been involved in successful HLF project bids for over £13.5 million of museum development funding. Agent representation: Ian’s writing is now represented by Donald Winchester of Watson, Little Ltd (http://www.watsonlittle.com/agent/donald-winchester/), apart from his work in relation to the musical Billy Bow, which is represented by Kate Weston of the Janet Fillingham Agency (http://janetfillingham.com/content/aboutus.html). 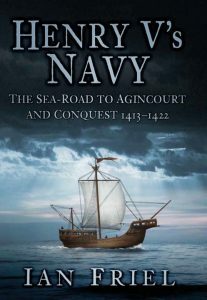 The search for the possible remains of Henry V’s great ship Holy Ghost – Ian is playing a key part in this. He has published an article on the Holy Ghost in Issue 53 of Scuttlebutt, the magazine of the National Museum of the Royal Navy (2016).